The ProForm Pro 5000 strikes a good balance between cost and features. With a 4.0 CHP motor, wireless heart rate monitoring chest strap, 38 workout programs and other great features, the Pro 5000 is an impressive treadmill. It also regularly goes on sale for $1,499, which is a great price for a quality treadmill. The Pro 5000 retails for $2,499 and regularly goes on sale for $1,499 (or you can add a ProForm promo code). Want variety when working out - With a max speed of 12 MPH and incline range from -3% to 15%, this treadmill can give its users plenty to work with. Need a cushioned treadmill deck - Some of our testers can’t run comfortably on harder treadmill decks, as they are rehabbing injuries. The Pro 5000 offers a comfortable deck that has enough cushioning to allow them to workout easily and without discomfort. Have multiple people who need the treadmill - When families go treadmill shopping, it can be hard to find one that appeals to the whole family. The Pro 5000 has enough variety to appeal to the whole family no matter the fitness levels. Powerful motor - A 4.0 CHP motor is one of the largest motors available in home gym treadmills. The Pro 5000 runs smoothly thanks to this motor. Heavy-duty treadmill build - The Pro 5000 has a strong frame and a wide base which keeps the treadmill steady no matter the speed and incline of the user. 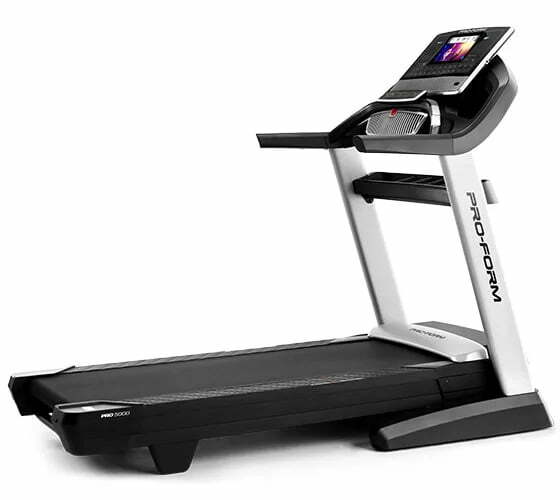 Great price - Compared to treadmills like the SOLE F80 and the Horizon Elite T7, the Pro 5000 has more features at the same price of these treadmills. The Pro 5000 is a sturdy, versatile treadmill which would suit a variety of users. Motor Size - The Pro 5000 has a 4.0 CHP motor. Equipped with a large motor, this treadmill is a workhorse which is up for multiple daily users. Running Area - A comfortable, wide running area comes with the Pro 5000. The treadmill’s belt space measures 22” by 60”. Weight Capacity - The weight capacity of the Pro 5000 is 300 lbs. Heavier users can check out the Elite T7 which can hold up to 350 lbs or the F80 which can accommodate a user weighing 375 lbs. Folding - The Pro 5000 has the ability to fold up and has a hydraulic system to allow for easier raising and lowering. Space / Footprint - The treadmill’s measurements when in use are 39.15” wide, 77.16” long, and 70” high. It is a fairly big treadmill and its sturdy frame will take up quite a bit of space in any room you put the Pro 5000 in. Even when folded up, this is a bulky treadmill so make sure you have the space for this treadmill before you purchase it. Max Speed - The Pro 5000 max speed is 12 MPH. This speed is standard for most treadmills. Incline - This treadmill has an incline range of -3% to 15%. With this much incline variability, the Pro 5000 can offer users a greater scope to train with. Workout Apps - The Pro 5000 comes with 38 pre-programmed workout apps. You can choose from beginner, intermediate, or advanced. For additional programs, you can also buy an iFit membership and connect the treadmill to the iFit Coach program. With iFit, you can virtually run trails around the world! Google Maps has paired up with iFit to allow users to see the area they are running on while the treadmill automatically changes speed and incline. Display - A high-definition, 7” touchscreen is the display on the Pro 5000. With it, you can connect to your WiFi and browse online, use the iFit Coach program, and switch between your entertainment and your workout stats. Speakers - The Pro 5000 comes with an audio jack and cord so you can plug in your music and utilize the dual, 3” speakers mounted at the base of the treadmill console. The sound quality is good and clear even at the higher volume levels. Fans - A two-speed fan is mounted under the console on the Pro 5000. This fan is positioned so that the majority of the air is aimed at the user’s core, helping the user stay cool more effectively than a fan that is pointed at the face. Heart Rate Monitoring - There is a wireless, adjustable heart rate monitoring chest strap that comes with the purchase of the Pro 5000. If you want an accurate idea of how many calories you are burning or to engage in accurate heart rate zone training, then you will want to use the chest strap. There are also EKG handlebar grips that you can use for heart rate monitoring, but they are not very accurate. A thick metal frame provides support for the Pro 5000. The thick, wide base with the crossbar on the upper frame keep this treadmill from bouncing as you workout. There are even rubber feet on the end of the treadmill to help stabilize the deck. The side rails on the Pro 5000 are thick plastic that doesn’t flex as you stand on them. The ProShox™ cushioning on the Pro 5000 makes this treadmill a comfortable machine to run on. While the deck is firm, it obviously has more flex than running outdoors does. ProForm has a live chat on their website which you can use to talk in real time to a customer support professional. You can also contact customer support by phone and email. If you aren’t completely happy with your Pro 5000, there is a 10% restocking fee if you utilize the 30-day money back guarantee. However, if your treadmill is damaged or defective in any way when you receive it, then there is no restocking fee if you return it. The ProForm Pro 5000 is a sturdy, high-tech treadmill that can appeal to a wide variety of users. The Pro 5000 has 38 workout programs to appeal to 3 different levels of fitness and a powerful fan that will keep users cool as they workout. Add in the wide treadmill belt and the ProShox™ cushioning, and you have a comfortable, highly functional treadmill. This treadmill would be an excellent choice, especially for a family looking for a treadmill to meet the various needs of family members. The best place to purchase the ProForm Pro 5000 is from the ProForm website. By going directly through the manufacturer, you will receive the best shipping care and the latest model of the treadmill you are looking to buy. Also, ProForm often runs sales on their website with better deals than could be offered by third-party treadmill sellers.